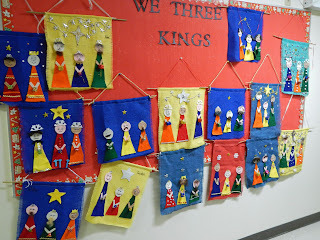 Well tomorrow is the last day of school and as of yesterday we had all the Christmas Projects completed. Yeah!!! A big thanks to my helpers, Ana, Colette, and Lori ! Here are some of the Angel plates Grade 1 completed. 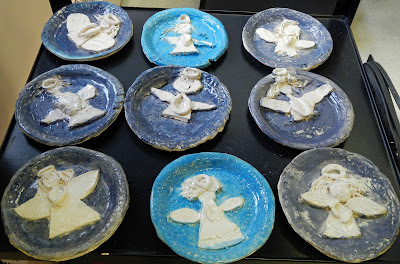 I did not get a chance to snag a photo of Kindergarten's Nativity plates but here is the original post. 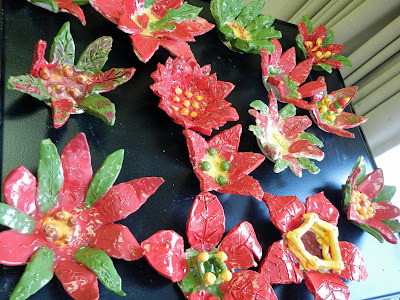 Here are Grade 6's Poinsettias. We have changed the design from my original post. We use a chinet bowl as a base to hold the clay into position while drying. 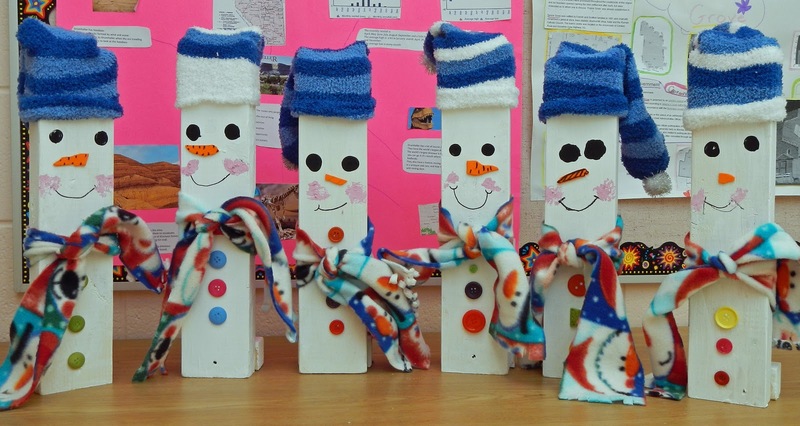 Grade 4 made these adorable wood Snowmen. Grade 2 did the Snowman Family Portraits on canvas but I can't show you them because of all the last names. They were terrific though. 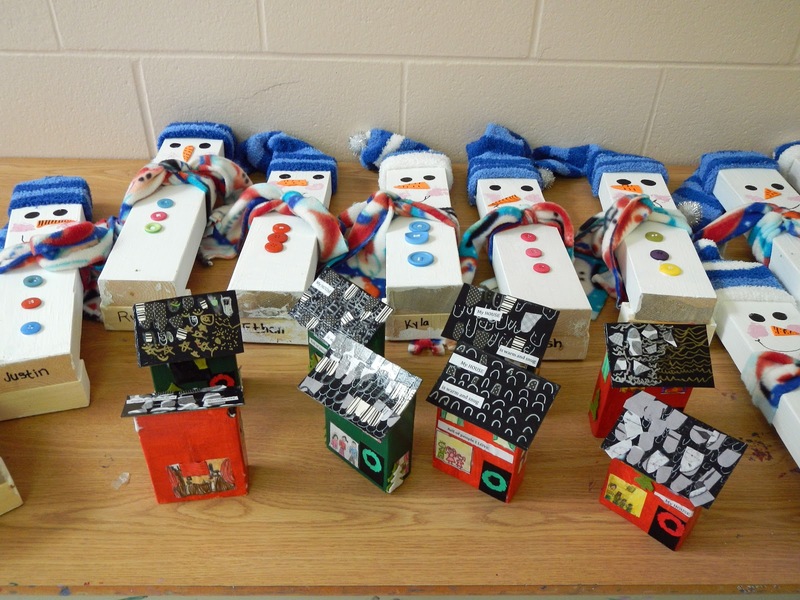 Grade 3 made the Christmas Houses. Here are a few I managed to photograph. 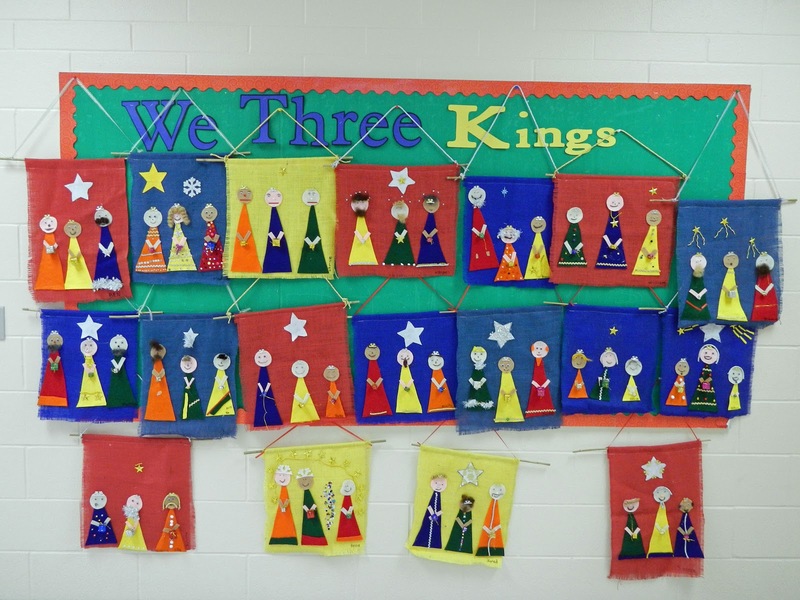 Grade 5 did the "We Three Kings" banners. 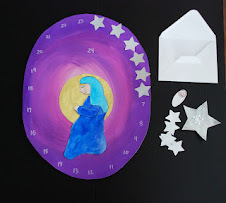 I still planning to post more last minute crafts if I get all my wrapping done. 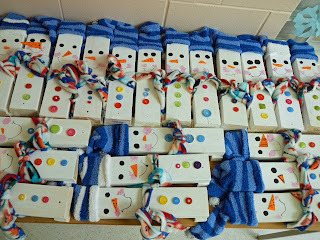 We had our 6th annual Christmas Craft Day at school on Friday, 150 kids, 12 crafts, one morning! A big thanks to all the volunteers who helped with prep and running the craft stations on the day. That was why the blog was quiet last week. I was knee deep in all the preparations! I have had a few inquiries as to how this all comes about. Basically Grade 1,2 and 3 rotate thru 12 craft stations in one morning. They can make all 12 or spend more time perfecting only a few. Now that it is over I thought I would show you all the crafts from this year over the next few days. 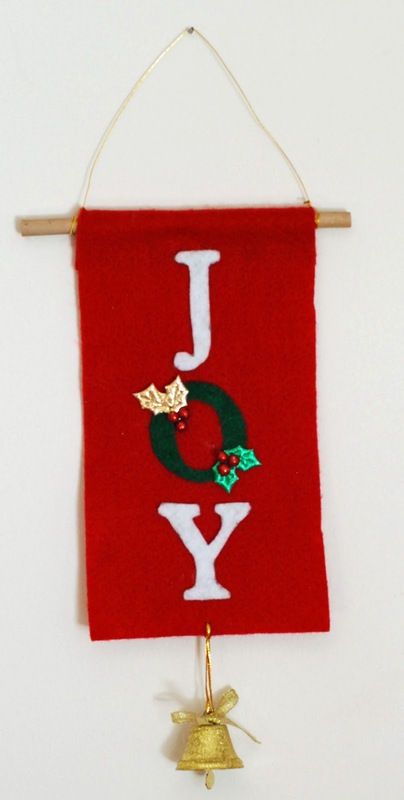 First up is the Felt Joy Banner. 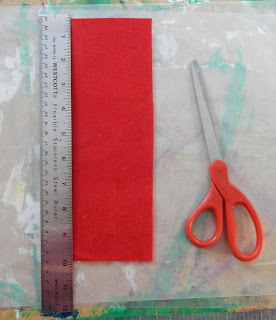 Cut a rectangle of felt in either red or green. 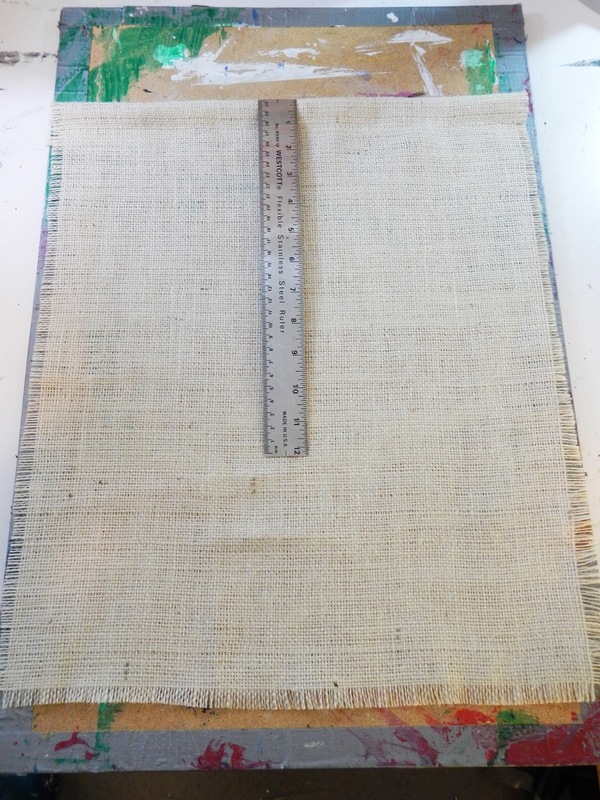 The dimensions we used was 10" x 5". 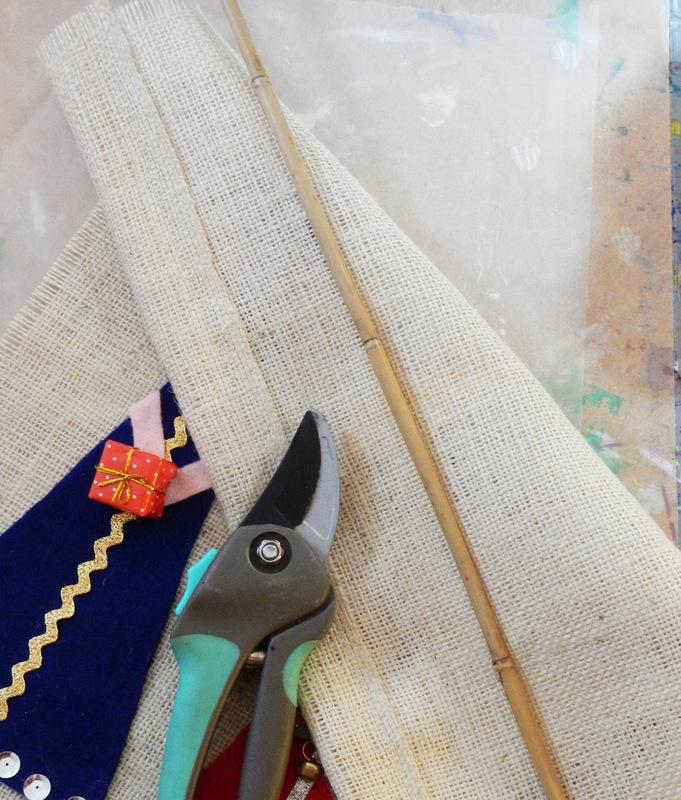 You need to make a pocket to hold the dowel. 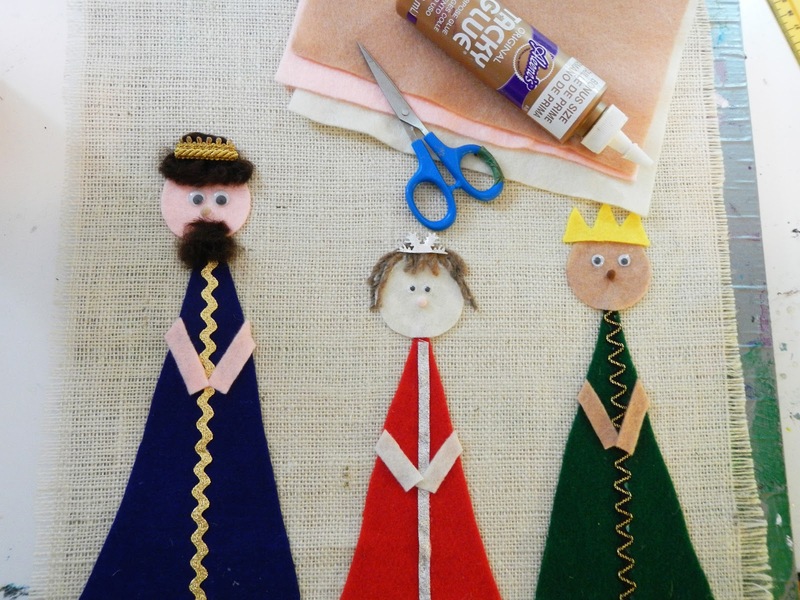 Now you can sew it or glue it. With 150 of these to be prepped we hot glued them all. Fold over an inch and secure in place. Now I have the pocket for my dowel. I used natural bamboo garden stakes that were cut into 6 inch long lengths. Cut with pruning shears. Out of white felt cut a letter "J" and a "Y". Make an "O" out of red or green. 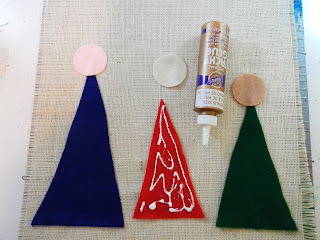 I used a letter stencil to make a template or pattern. I cut the template out of recycled cardboard (a cereal box). back side. Use tacky glue and glue into place on your banner. 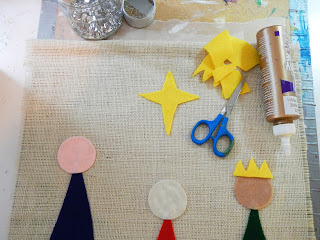 Add some embellishments. 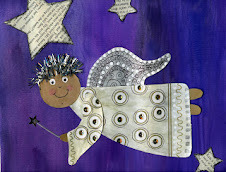 I scouted thru the Dollar store and found these shiny fabric Holly leaves. We clipped them apart and added them to our "O". I also found these glitter balls which worked great as Holly berries. You could also cut the leaves out of felt and use red buttons for the berries. 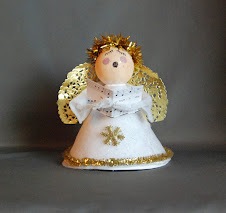 I bought bells at the Dollar store as well. 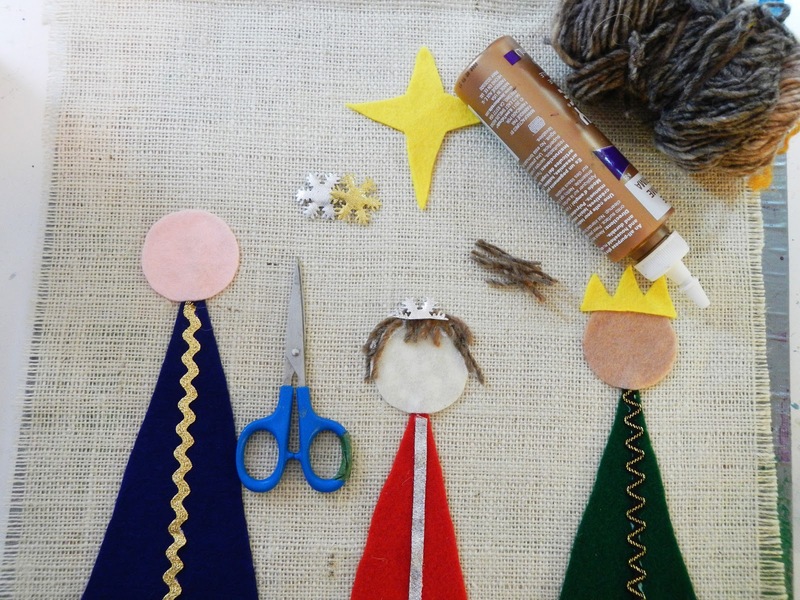 Make a little hole in the felt at the bottom of your banner. 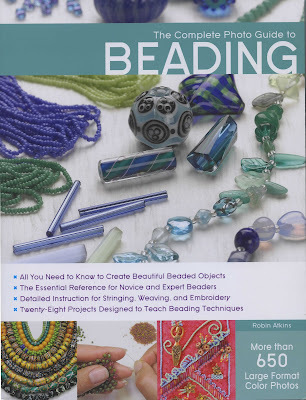 Push the loop of the string thru the hole, pass the bell thru the loop and your bell is now securely fastened. Take a 12 inch piece of craft wire. Twist onto one end of the dowel and then on the other. This is the hanger. 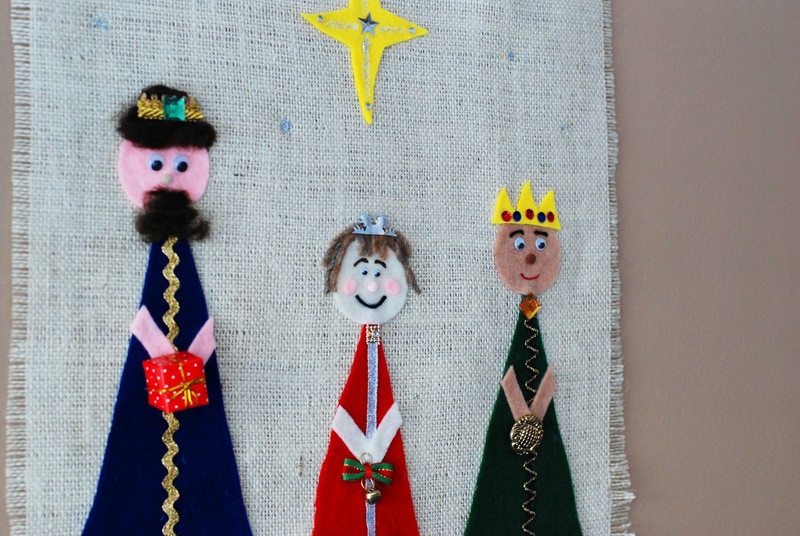 3 years ago we made this JOY sign but I didn't have enough cardboard this year for 150 signs so we went with felt instead. You can find the tutorial for this sign HERE. I tend to only repeat crafts every 3 years so the individual student doesn't get any repeats during their 3 years participating. 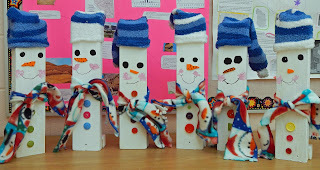 Some other crafts we revisited this year was the Little Snowman. We also did these paper trees. 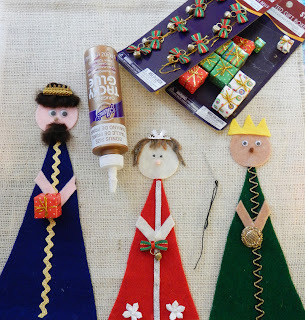 I'll be back next time with more Christmas Craft Day activities. 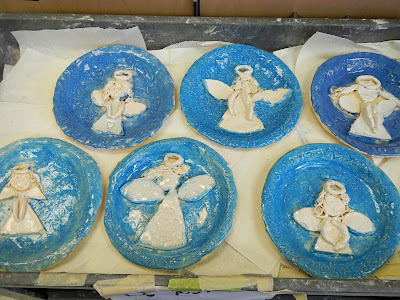 This is Grade 5's Christmas project. 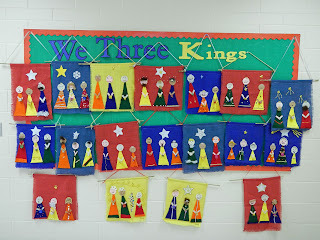 A now retired teacher at my school, Mrs. D, would do this every year with her class. We have brought it back and will continue the tradition. Incidentally Mrs. D is where I got my trade name from. When I first started working at the school she couldn't remember my name so I was always "that artist woman"! This one is for you Mrs. D.
Cut out a nice rectangle from the burlap. For the Grade 5's I have assorted colours. Fray the edges. 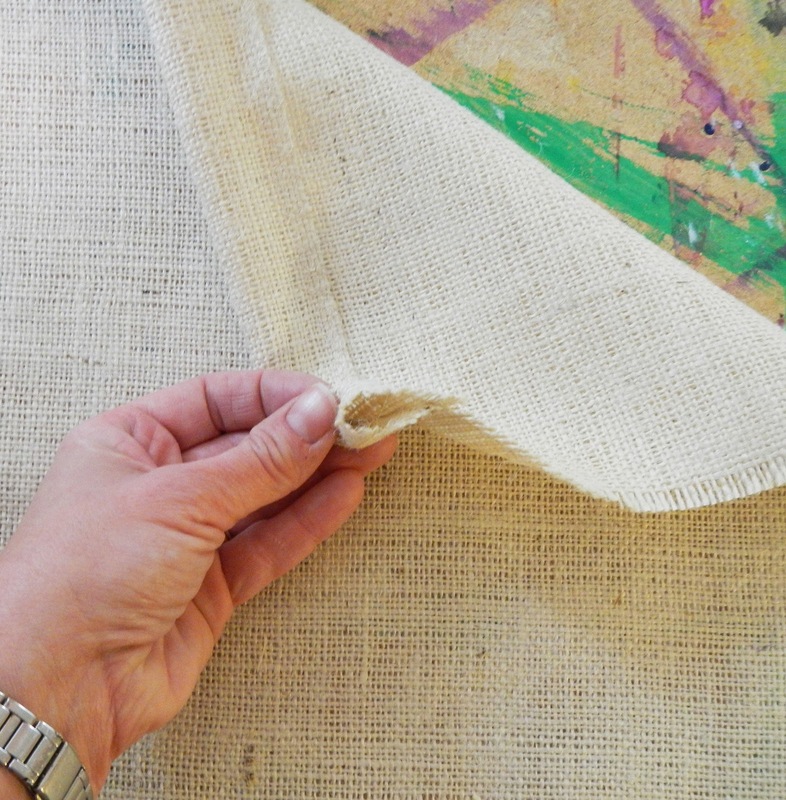 Burlap has an uneven weave, that is part of it's rustic charm. But that means it's difficult to get a nice fringe just by pulling threads. 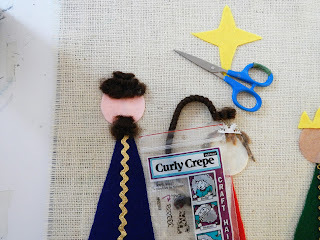 One end will always be longer, you can fix this by just giving them a trim with your scissors so the fringe is even. You now need to make a pocket at the top to hold the stick/dowel we will use for hanging. If you have access to a sewing machine you can whip that off straight away. 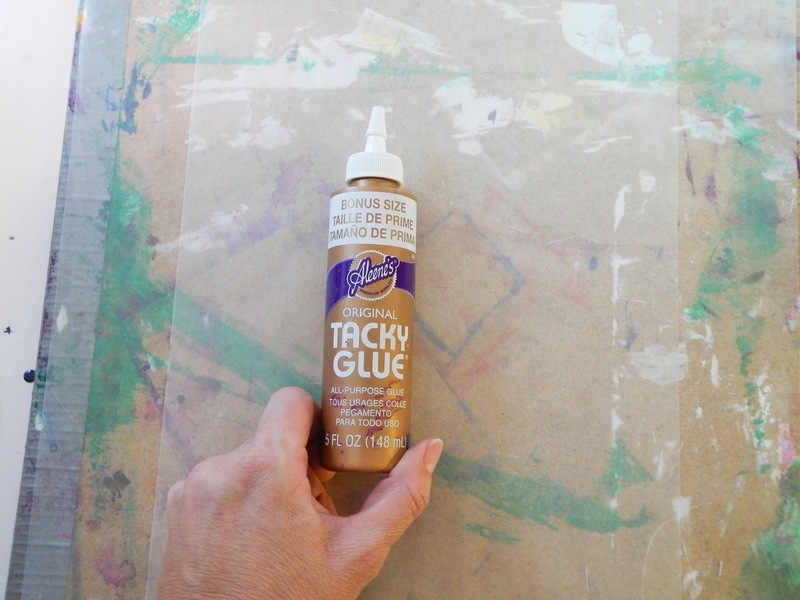 If not just run a little tacky glue or hot glue from the glue gun to secure in place. Taking 3 different colours of felt cut 3 long triangles of 3 different heights. 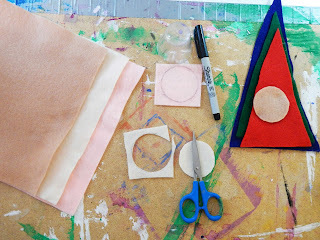 Take a round object, trace around it with a sharpie on 3 different flesh toned pieces of felt. If you don't have 3 different colours it's no big deal it will still look fantastic. 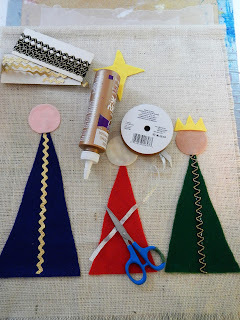 Cut out clipping away that sharpie line. 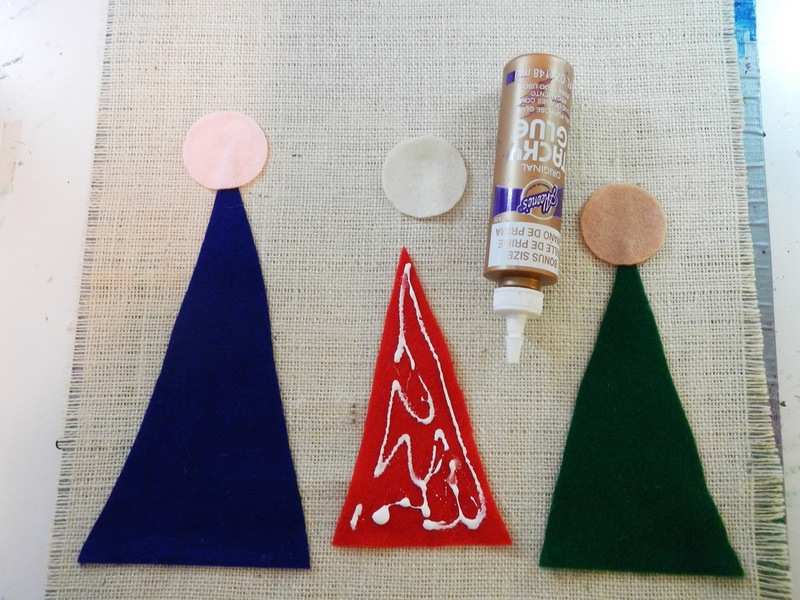 Before we start gluing the banner you need 2 important things. 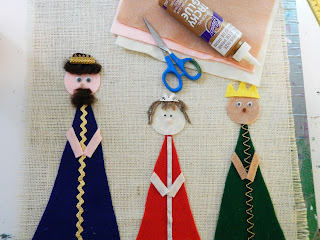 Tacky glue works so well on this project. I find regular white glue just gets sucked up by the felt and then doesn't stick. The second important thing is a piece of wax paper to go under your burlap banner. The loose weave of the burlap causes the glue to seep thru. 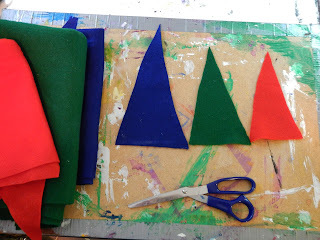 Lay out your triangles and heads on the banner. 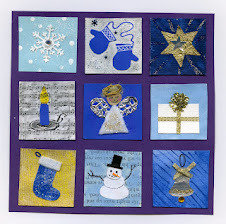 You could go tallest to smallest but I like to mix it up a bit so I put the smallest in the center. Cut a nice large star out of felt. You can also cut out a crown or two. 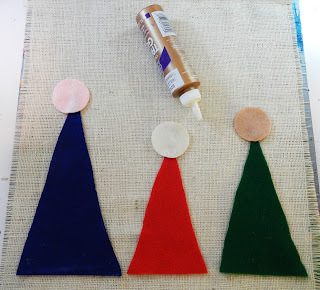 Add some trim to the front of the triangles. You can use ribbon or rick rack. 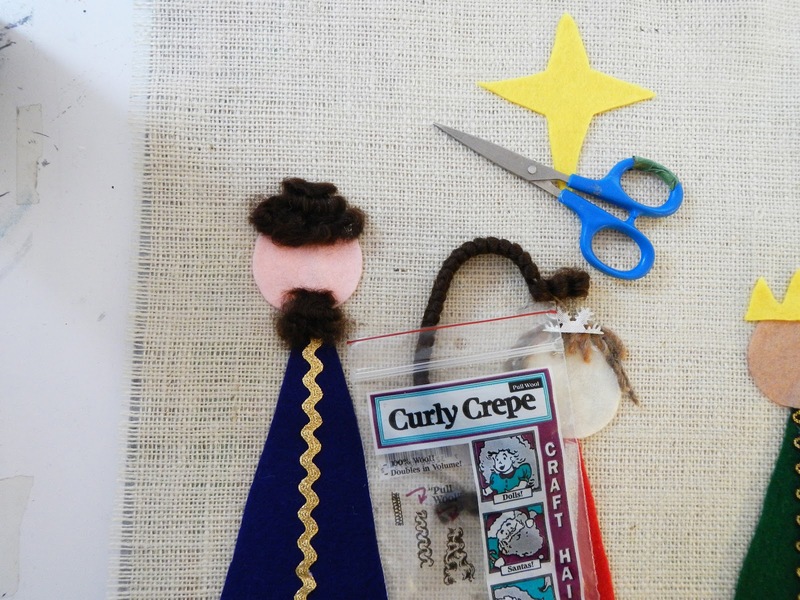 You can add some hair with yarn. A snowflake cut in half makes a good crown. You can add curly hair and a beard. Glue on some eyes. I just happened to have 3 sizes. 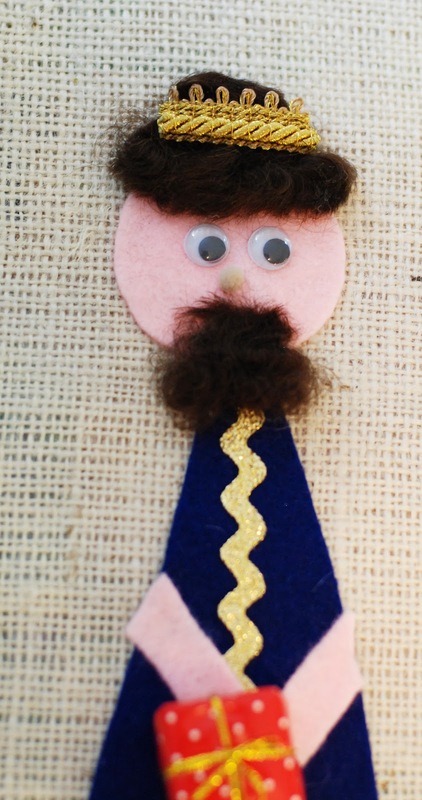 Add little pompoms for a nose, you could also use a small piece of felt , a button, or bead. Add some felt strips for arms. 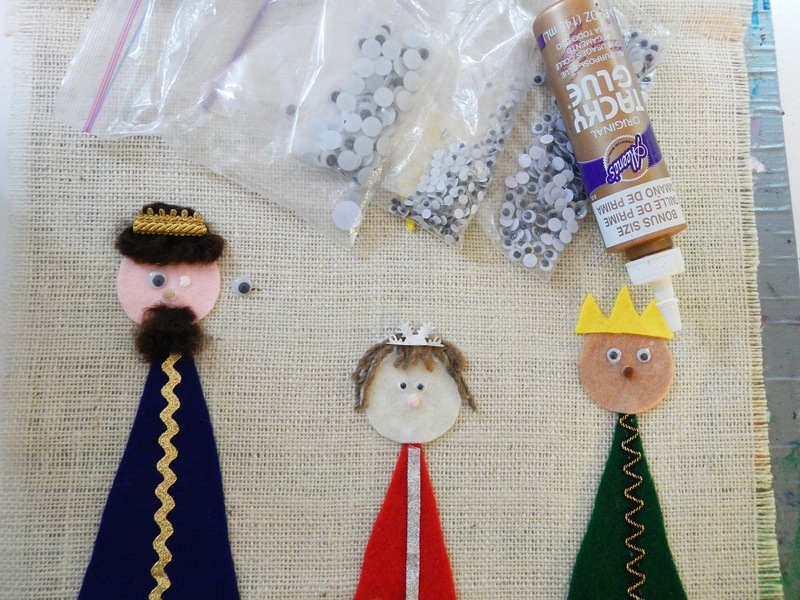 Using little trims or buttons add the gifts for each King. Continue embellishing with sequins, gems, whatever you have on hand. Add some glitter glue to the large felt star, use it to make other small stars in the sky. 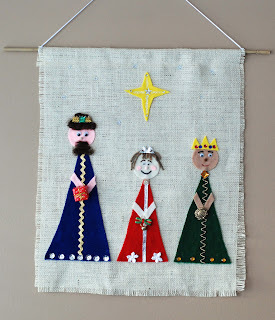 Finally add a bamboo stick or dowel for hanging with some string or ribbon attached. I buy these natural bamboo garden stakes and then just cut them down to size. They only cost about $2.00 a pkg. Make it as elaborate as you want. 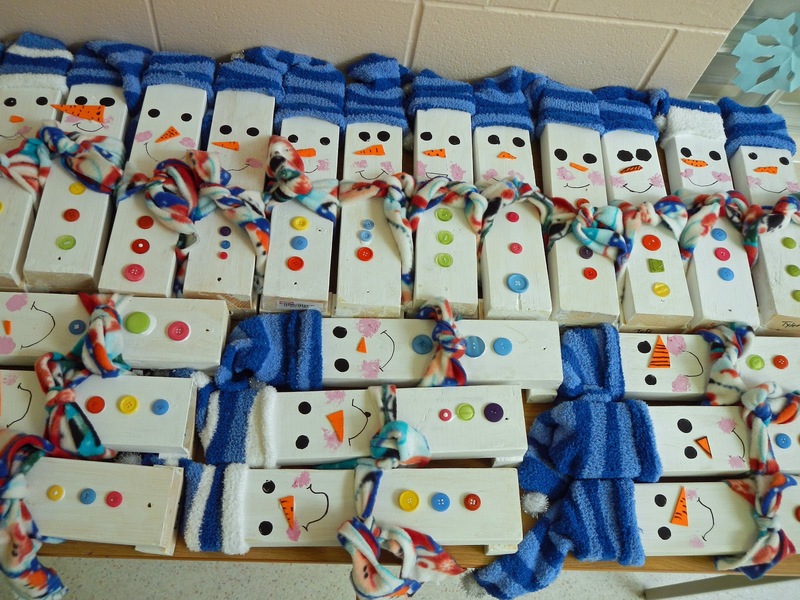 I can't wait to see how Grade 5 does with these next week. I'll try to post a photo.